Publisher: Audio Edition (what I read): Books on Tape, 2013. Original publication (as The Case of the Good-Looking Corpse) 2012, 313 pages. Newly-orphaned 12-year-old P.K. Pinkerton has hung up a shingle and gone to work as a Private Eye in Virginia City, Nevada in 1860-something. Business is slow until Martha, a young servant girl, comes looking for someone to find out who killed her mistress, Short Sally. P.K. takes the case and finds it a challenge--and a risk. With the help of P.K. 's main ally, Poker Face Jace, and a bit of aid from a young journalist named Sam Clemens, justice prevails, but not without a lot of excitement! Here's where I would be reviewing the book, only I got distracted by something. See, P.K. clearly has Asperger's Syndrome (a form of high-functioning autism). This manifests in a dislike of being touched, a fondness for collecting things (and organizing them), and an inability to read emotions--or recognize faces. It was that last that sent me off track. Because I don't recognize faces very well either. P.K. refers to the problem as "my thorn," referencing St. Paul and his "thorn in the flesh" that was some mysterious ailment that kept him (St. Paul) from doing all he wished. In the same way, P.K. considers face-blindness (official name: prosopagnosia) a handicap. And I read a review that objected to presenting this as a handicap, because we don't want to stigmatize Asperger's as a handicap (I can't find that review, and may not even remember it correctly. It doesn't matter, because it made me think). The thing is, face-blindness *is* a handicap. Especially for someone who wants to be a detective. The interest here is in how P.K. works around it (though I'm not sure his work-around would work, because it seems to me more of a means of remembering names than faces. I'll try to experiment, but Lawrence may have slipped up here). All this leads me to what I know about prosopagnosia, which is mostly that a) having had it, apparently, since birth, it took me a really long time to figure out why other people could follow movies so much better than I can, and b) that it has usually felt like an excuse when I explain why I wasn't slighting someone just because I didn't recognize them. Oh, and c) it's a little awkward for a writer, too (I tend not to give my characters physical descriptions). What I also know is that I recognize many people quite well--by distinctive features, hair, clothing, or gait. So I did a little research. One thing I learned is that face-blindness (let's stick to the pronouncable version) is not necessarily an aspect of Autism, but there is a lot of overlap. In my case, I'd say it's related, as my oldest son has Asperger's, and I have recognized a lot of signs and symptoms in the literature as also applying to me. So it's not a common aspect, but makes sense for P.K. to have it along with the other issues. And it makes an intriguing problem for the young detective. I also learned that some people (maybe most?) acquire face-blindness from some trauma. Those people are probably driven more nuts by it than I am, because they know how this stuff is supposed to work. I found some very good info at https://www.faceblind.org/research/, including a test to see if you have it (if you take the test, please leave a comment about it). Yeah, I'm not crazy. Apparently other people can recognize faces even without hair and stuff. They even recognize actors when they change costumes! Who knew? Finally, to return to the book, I want to say that I have been enjoying this series a lot. On the other hand, though it is apparently written for middle-grade students (writing level seems to match), the content is often pretty adult, and the story is more like an adult western. There is little or no bad language, but there are gun fights, dead bodies, and (what would you expect in a mining town like Virginia City in it's heyday?) most of the women are prostitutes, delicately referred to as "soiled doves." And P.K., who is half Lacota Indian, is subjected to the racism that was rampant at the time. Make your own judgement about appropriateness for your child. Oh, and just to finish: if I meet you somewhere, then don't recognize you the next time, please don't be offended, even if it happens more than once. Just remind me who you are and let it go. Thanks. Full Disclosure: I checked P.K. 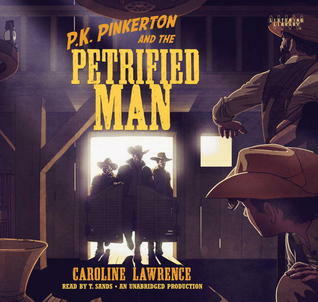 Pinkerton and the Petrified Man out of my digital library, and received nothing from the writer or publisher in exchange for my honest review. The opinions expressed are my own and those of no one else. I am disclosing this in accordance with the Federal Trade Commission's 16 CFR, Part 255: "Guides Concerning the Use of Endorsements and Testimonials in Advertising." I took the first test and scored 39%. That doesn't really bode well, does it? Took the second test and scored a flat 0 - really not impressive. I scored 15% on the first test. I don't recall what I got on the second; I may have to go take it again. I didn't realize you also had trouble in this area. Great review and analysis! I did the face recognition test - I think I tend to muddle people up unless I know them well. I got 73%, which was lower than the average they gave at 85%, but I noticed most of those I missed were women... so I remember the male famous people better than the female ones? Interesting. There could be cultural bias in there too, though as the females I didn't recognise were also American. Then again there were two politicians I didnt recognise (1 US, 1 UK) but I think they were just awful pictures of them! Well, from my position, 75% sounds pretty good! And two of the 3 I got are so distinctive that it's not really about recognizing the face...my future in politics is definitely limited by this (thank all the gods). They used a range of people--politicians, celebrities recent and less so, etc. There were a lot I don't know well enough to recognize even if I could recognize them, but there were those I felt I should know! Love the Curious Incident--very good book. I took the first test and scored 90%. It was an interesting selection of faces. My brain tends to click on the small details and my mom lives in Canrson City, so I have been to Virginia City many times. The setting and historical connection makes me want to read this, but I am also nervous about how many times I'd be saying, "That's not right." Thank you very much for the review...even your sidetrack was very pertinent to the book and review. I haven't been to Virginia City, so I can't speak to the accuracy of the geography of the town. But it rings pretty true. Do read the books in order. I messed up, and ruined a few surprises.